ADDIS ABABA (AFP) — Opposition protesters staged a rare demonstration in the Ethiopian capital Thursday, demanding the release of an official jailed for life in January. 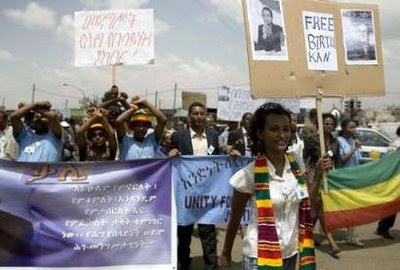 Some 300 people massed outside the presidential palace and then marched towards Prime Minister Meles Zenawi's office in Addis Ababa in the first such protests since 2005, when disputed poll results sparked violence. The group called for the release of Birtukan Midekssa, an opposition leader sentenced to life in prison after she reportedly denied ever expressing remorse to obtain a pardon in 2007 for treason and outrage against the constitution among other offences. Birtukan, the head of the Unity for Democracy Justice (UDJ) party, had been detained with dozens of opposition figures and supporters following the 2005 elections. "Our aim is to publicise the illegality of her detention, and to demand her immediate release. We demand the restoration of her pardon," Yacob Hailemariam, UDJ's deputy chief, told AFP. Birtukan was only granted visiting rights by an Ethiopian court on Wednesday, but her release now depends on a government pardon board, which in turn will submit its decision to President Girme Wolde Giorgis. "It was one big step in the whole process to have her family and lawyer allowed to visit the prison. We will resume our struggle to reach the next stage, which is to have her released," party spokesman Hailu Araya told AFP. The UDJ made its most spectacular electoral gains ever in the 2005 polls but cried foul over reported fraud, claiming it was robbed of victory by Meles' ruling party. The United States, a staunch Ethiopian ally and the country's top aid contributor, has expressed concern over the 36-year-old's re-arrest and called for more political freedom in the Horn of Africa nation. Ethiopia's next general elections are to be held in June 2010. Meles, whose security forces were blamed for using excessive force four years ago, has vowed to prepare law enforcement agencies to avoid bloodshed in time for next year.